Most of the inhabitants of New Angeles are just regular people living regular, boring lives. They wake up, go to work, order takeout from their favorite fast-food joint on their way home, then spend the evening with their families and friends, or logged into the Network enjoying an entire solar system’s worth of entertainment. Then they go to bed—only to wake up the next morning to do it all again. Yesterday, that could have described you. Tomorrow, you may wish it still did. 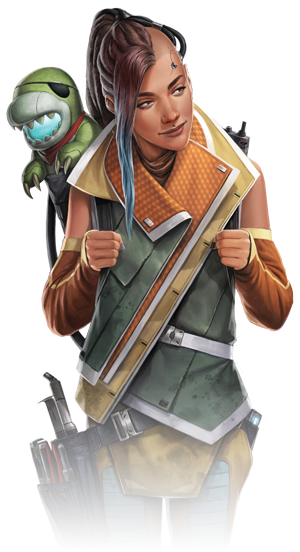 Join us today as we preview some of the new character creation options introduced in Shadow of the Beanstalk, an Android sourcebook for Genesys Roleplaying! 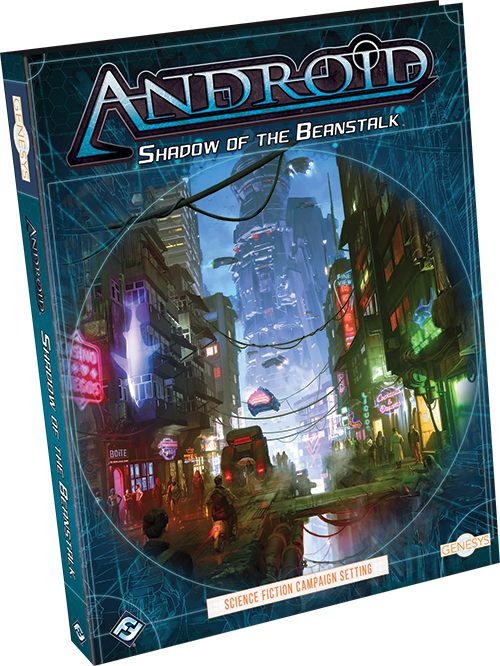 Shadow of the Beanstalk takes the concepts and rules of archetypes and careers found in the Genesys Core Rulebook and adapts them to characters living in the near future, in the bustling city of New Angeles, in the shadow of the beanstalk. These characters are supplemented with new equipment and skills to help them survive the day-to-day struggles of a world under corporate control, where advances in technology have made anything possible. 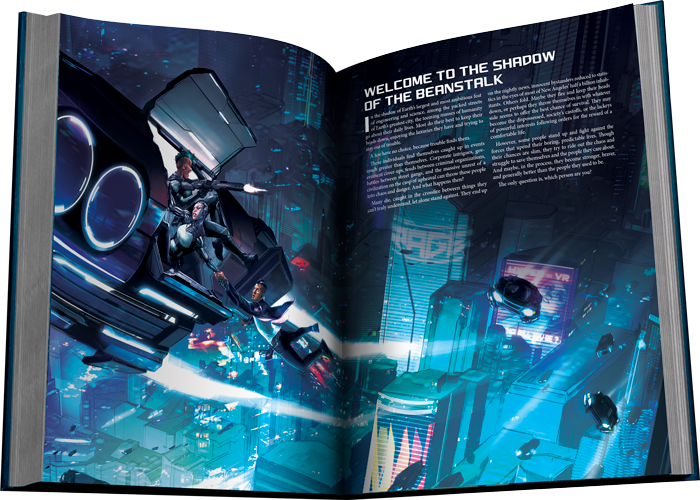 While many of the archetypes found in the Genesys Core Rulebook can work in the Android setting, Shadow of the Beanstalk provides plenty of rules for specific archetypes pre-established in the universe to help immerse yourself in the setting. 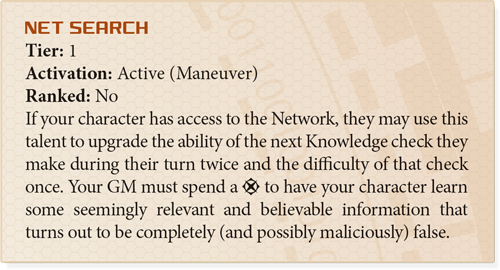 And of course, while these archetypes are designed specifically for use with the Android setting, they can also be easily adapted to any Genesys campaign taking place in a cyberpunk future! Just one of the new archetypes that you can explore in this sourcebook are the lifelike automatons known as bioroids. Bioroids are fully artificial creations, with all the attendant benefits and disadvantages. Their strength and durability are second to none, allowing them to go places and undertake tasks that normal humans or even clones cannot. On the other hand, bioroids are not viewed as people, but rather property. Likewise, bioroids find it difficult to become accepted in some places; their artificial appearance conjuring fear or hatred in certain groups. Furthermore, all bioroids are limited by their directives, such as "do no harm to humans," and "do not let humans come to harm through your inaction." These directives cannot be broken, and as hardcoded drives, they prevent bioroids from obtaining true freedom. Yet rumors persist on the streets of New Angeles of bioroids who have broken their programming or evolved beyond it to become something more. As machines, bioroids do not need to eat, sleep or breathe, and are unaffected by deadly toxins and poisons. They also cannot recover wounds through pain killers or a medicine check, instead relying on rest and mechanics checks to revitalize their systems. If you like the idea of playing an artificial person struggling to understand their place in the world, a powerful companion and ally, or a liberator fighting against the injustice they see in society, a bioroid might be the right choice for you. 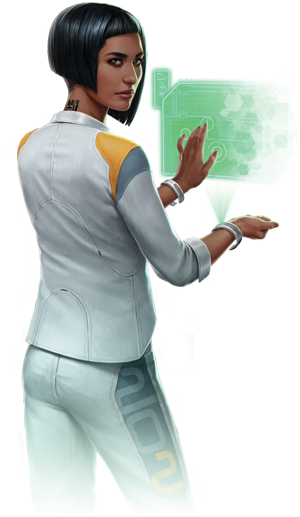 While Haas-Bioroid perfected the production of bioroids for labor, the Jinteki corporation’s clones fill a similar role. There are numerous clone lines, each created for a specific purpose. These include the Henry line of diligent and durable workers, the Molloy line of skilled cooks and cleaners, the Tenma line of fearless pilots, and the Desai line of patient and intelligent tutors. There are even specialist clone lines created for specifically research or other, stranger purposes. Like bioroids, clones are kept in check by their creators, each undergoing neural conditioning. While a clone is as intelligent as a natural-born human, their conditioning ensures that their mind only works a certain way and they can only consider certain responses. 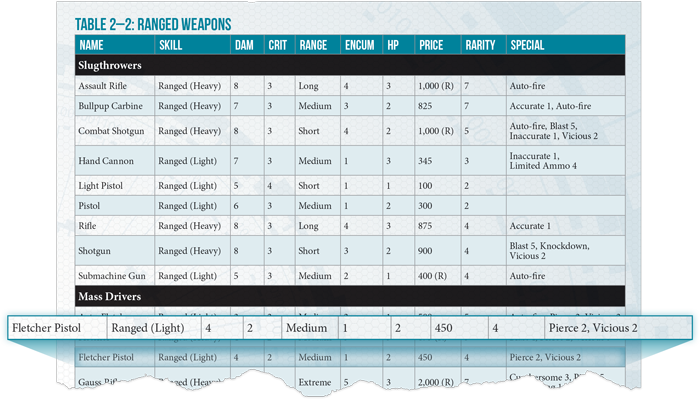 Defining your clone’s specific purpose allows you to gain two ranks in two different skills during character creation. 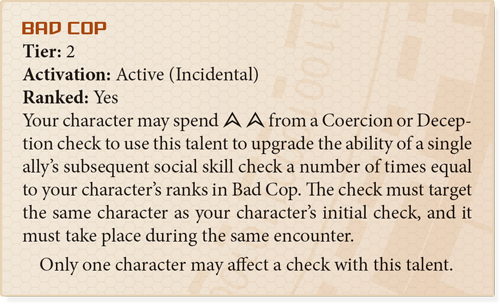 Furthermore, society’s general underestimation of clones and their abilities allows you to add an advantage to opposed checks. If you like the idea of playing a liberated rebel hiding in plain sight, an intelligent but naive person experiencing the world for the first time, or someone who sees themselves as an improvement over “normal” people, a clone could be right for you. Clones and bioroids offer a strikingly unique option for your character, and these are just two of the archetypes that await in Shadow of the Beanstalk. But creating your character doesn't stop with the archetype. While these new archetypes define who your character is in the world of Android, ten new careers in Shadow of the Beanstalk define what they do—from hard-boiled detectives drinking themselves to an early grave to scholars pushing the boundaries of knowledge and science in a world dominated by technology. They may be NAPD detectives, or private eyes, or corporate agents and independent profilers, but no matter where they work, investigators are masters of getting information. In worlds where people will go to great lengths to hide their crimes from the countless electronic eyes that watch society, sometimes only a human with tested instincts can pick up the trail. Investigation is as much art as science, and good investigators learn to rely upon their gut, knowing when to squeeze for information and when the truth requires a light touch. Investigators need smarts to be successful, and many of their skills revolve around knowledge and perception. But when things get hairy, investigators may also need a good weapon at their side, like the Fletcher Pistol. As far as talents go, anything that enhances the group's social skills will be useful in your role as an investigator. Getting the information you need is your job, and in the neon wilderness of New Angeles, that might mean using coercion, deception, and knowledge to get the job done. On the other hand, you may choose to dedicate yourself to the life of a runner, the talented hackers who thrive in the Network. These are the warriors of the virtual world, and though they might appear like ordinary people or androids when they walk the slidewalks of New Angeles, they are giants in their digital environment. To master the programmed world of the Net, defeat its denizens, and overcome its many dangers is no easy feat. For most people, if there is not an appropriate function on their PAD, they have no idea how to go out into the virtual world and find something, let alone something that doesn’t want to be found. Good runners are prizes almost every agency in New Angeles will fight over, for these are the people who hold the keys to the true battlefields of the future and who have the ability to win in the constant digital wars fought between the corporations. Runner’s skills naturally revolve around computers, whether that be knowledge of the Net or how to find something that doesn’t want to be found. Any decent runner will have a PAD stocked with a few icebreakers, and we’ll take a look at how these tools are used to run the Net in a future preview! But a runner’s usefulness comes from far more than just hacking. A Net Search talent can help you find useful information if used properly, but can also lead unsuspecting runners astray should things go horribly wrong. No matter what career your character finds to get by in life, your skills will be essential to your survival in a world that never sleeps. Determining archetypes and careers are just the first steps in your journey. The world changed, but what does it have in store for you? You’ll have to use your background and specialized skills if you hope to survive, and maybe make a profit along the way. Enter a new world with Shadow of the Beanstalk (GNS04) available now for pre-order from your local retailer or our website and releasing in the first quarter of 2019!